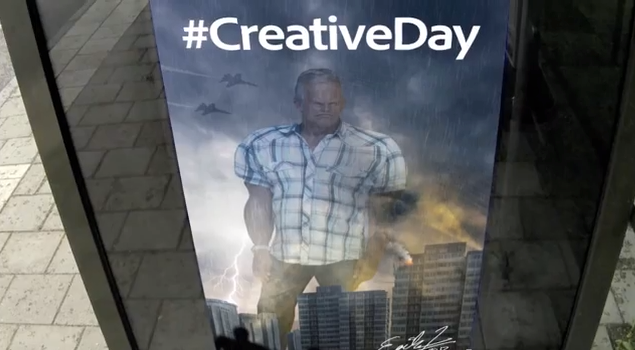 Working with Swedish agency Abby Norm to promote Adobe Creative Day, Adobe pulled a delightful bus stop prank that involved clandestine photography, on-the-fly-digital manipulation and some nifty diorama dynamics. Commuters who visited a Stockholm bus stop, were photographed and quickly added to an electronic billboard next to the bus stop. We've seen ambush stunts before and most come off as overly invasive. Not this one. This one has fun. A of of fun and those pranked truly seem to have enjoyed their digital manipulation experience especially one man who was transformed into a he-man-esque superhero. The video of the prank has been viewed 9.5 million times since it was posted Friday.